Both the fort and the gun were restored in recent years and are now open and accessible to the public. Fort Rinella is part of my list of the 29 Best Museums and Tourist Attractions in Malta. The fort was built in the shape of an irregular pentagon surrounded by a deep ditch. It has two levels, an underground structure where one can find the loading-chambers and a ground level with accommodation for the soldiers and machinery chambers. The main attraction of the fort however is the impressive 11-metre long gun built in Newcastle by Sir William George Armstrong. It was the world’s largest muzzle-loading cannon ever to be built, powered by hydraulics and capable of shooting a one-ton shell every six minutes. Its range was also incredible, being able to hit targets at a maximum distance of eight miles. Highlights – Why should you visit Fort Rinella? The fort is worth visiting if you’re into military history and period re-enactments. Both the gun and the building itself are worth seeing, but more than that, it’s the shows that really animate the place with troops dressed in World War 1 British uniforms, a cavalry display and a fencing demonstration that goes through the history of swords. You can go around the fort at your own leisure or join a guided tour. A visit to Fort Rinella includes a guided tour and a film show that runs every hour about the history of the fort and its 100-ton gun. Free audio guides are available in Arabic, English, Dutch, German, Maltese, Spanish, Russian, French, Danish, Chinese, Japanese and Italian. An exhibition entitled ‘Soldiers of the Queen’ focuses on Queen Victoria’s Army from 1837 up to 1901. It features 3,000 period objects ranging from original weaponry, uniforms and equipment including many rare items. 13.00hrs – Swordsmanship Display with a walk-through the historic evolution of the sword from antiquity to present day. 14.00hrs – Guided tour and historical re-enactment. This includes aspects of 19th century British military drill and fighting skills as practiced by the British Tommy in the days of Empire. Including the firing of live-historic artillery and a cavalry show. If you want to visit Fort Rinella by night, you can book as long as you’re a group of 5 or more. Night Group fees are €15 per adult or €5 per child u/16 years. Night Tours are 3 hours long and are held between 6pm and 11pm. These tours include an experienced tour guide in period uniform, film show, fort and museum tours and musketry firing. Bookings for night tours can be made by email to info@wirtartna.org or phone: +356 7987 4153. Usually, Fondazzjoni Wirt Artna, the organisation that maintains Fort Rinella and its museum, organise an open day in late April or early May. 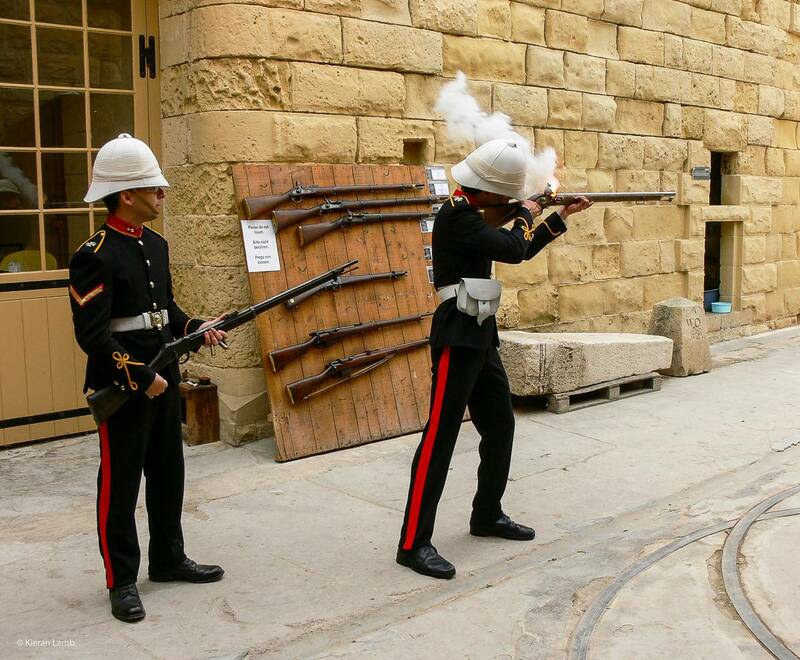 During the day a special programme is followed with live reenactments and firing of the actual gun. Keep an eye on their website for announcements of this special event. Visitor information – Why should you visit Fort Rinella? Fort Rinella is located in Kalkara, one of the Three Cities, which is located on the eastern side of the Grand Harbour across from Valletta. If you’ll be looking to drive there yourself, just follow the signs from Cottonera (Three Cities). To reach the Fort Rinella by bus take route 3 to Kalkara from Valletta. The bus stops right outside the main gate. The bus leaves Valletta every half hour all week except on Sundays when it’s on the hour. Closed on New Year’s Eve, New Year, Good Friday, Easter, Santa Marija 15 August, Christmas Eve and Christmas. Children under 16 years: €5.